Fully coversJD 316 Lawn & Garden Tractor. 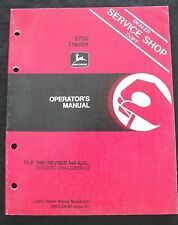 JD 316 Operators Manual. This operators manual includes This comprehensive manual includes. Onan B43G Engine. Keep your Machine Adjusted and Correctly Serviced for Long Life. Overall great condition! Minor wear on cover. Happy Buying! FOR SALE IS MANUAL PICTURED. YOU ARE BUYING: John Deere Technical Information Manual Book for 1250, 1450 AND 1650 Tractors Technical Manual TM-1253 (JUN-84). Brand new still sealed in shrinkwrap complete service technical manual covering the John Deere 4110, 4115 Utility Tractor. This Service Manual Covers the Following Serial Numbers: ALL. Covers 210-430 lawn and garden tractors, 650 thru 2350 tractors, 2040-2240 tractors. In an John Deere binder - not the one this would probably have normally been held in. This is an ORIGINAL John Deere Dealers's 2150 & 2350 Tractor Brochure Catalog (01/84 printing). This brochure contains super illustrations as well as having very in-depth option, accessorie, and specification information for these legendary Deere tractors. This is an ORIGINAL John Deere 850, 950, & 1050 Tractor Operators Manual (OMRW19870, May 1984 printing, serial numbers on the cover). The condition of the cover is very good with NO tears or tatters. This is an ORIGINAL John Deere JD 5720 & JD 5820 Forage Harvesters Technical Service Manual (TM1244, printed in December 1984, covers ALL models). This manual has super illustrations as well as having in-depth service, repair, tear-down, rebuild, system testing, and specification information for these hard working Deere harvesters. 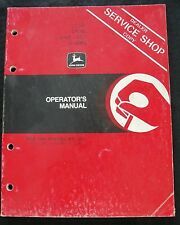 This is an ORIGINAL John Deere 2950 Tractor Operators Manual (OM-L39652, August 1984 printing). This manual has super illustrations as well as having in-depth operation, specification, and maintenance information for these classic Deere tractors. John Deere Manuals. Manual is in very good condition for its age. Included in the brochure, are great photos, specification, features and benefits and more. 14.5 to 60 PTO hp Diesel Tractors. John Deere. Dealer Sales Brochure. Condition: The brochure. is in overall, good condition with light soiling and slight rippling. John Deere 4110 4115 Compact Utility Tractor Technical. Manual is in good used condition. No missing pages. Service Repair Manual. 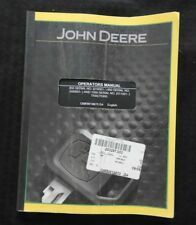 JOHN DEERE 1250 1450 1650 TRACTOR REPAIR & OPER TEST TECHNICAL SERVICE MANUAL. Condition is Very Good. Shipped with USPS Priority Mail. 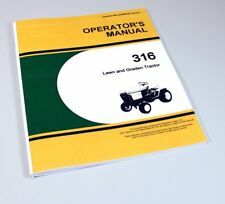 An original 1982-1984 John Deere 430 420 210 214 212 316 318 lawn garden tractor service info manual. 350 pages, in a hard cover binder. This is an ORIGINAL John Deere 850, 950, & 1050 Tractor Operators Manual (OM-RW19870, June 1984 printing). The condition of the cover is good with NO tears or tatters, but has scuffing along the spline.